Todd Beyreuther, researcher and founder of Mass Timber Structures, explains cross-laminated timber. With its growing economy and plentiful natural resources, Washington State is positioned to become a leader in the development of a cross laminated timber (CLT) market in the United States. 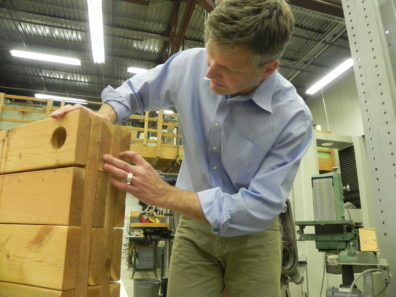 WSU researcher Todd Beyreuther and his team are partnering with public and private partners to bring the manufacturing of this sustainable building material to Washington. CLT can be manufactured with lumber from thin trees that are susceptible to pest-outbreaks and pose catastrophic fire threats like those we experienced last summer. Manufacturing coss-laminated timber in Washington would make use of those trees, while supporting local businesses and growing jobs in rural towns that once depended on the timber industry. Beyreuther and his team are partnering with public and private organizations to create a supply chain that would bring the panels from rural towns, to the growing urban centers which can benefit from sustainable building materials. The supply chain leverages existing mass-production methods of forest products industries, and engages the mass customization methods and technologies of the architecture, engineering, and manufacturing communities. In addition to supply chain development, WSU researchers are exploring additive manufacturing and integration of new technologies into CLT that will contribute to smart building and smart city environments. Beyreuther and his team are integrating CLT into a smart city effort in Spokane which aims to bring sustainable design, smart grid technology, and alternative fuel systems together to demonstrate the impact. Beyreuther and a team involved in this research have started a company, Mass Timber Systems, LLC. (MTS), to help advance supply chain development. MTS is a design-build entity that will fill a critical gap between the companies that will mill and manufacture cross-laminated timber (CLT), and the market-facing architecture, engineering, construction and building operation (AECO) teams who will use and install the CLT. Additionally, through joint MTS-WSU faculty appointments and activities, MTS maintains an important connection to research, development, and testing that take place at the WSU Composite Materials and Engineering Center. The startup and researchers are seeking investment and strategic partnerships – please contact Todd Beyreuther if interested. Liquefied hydrogen – which can be used in fuel cells to power electric car and aircraft – is one of the cleanest alternative fuel options that can also be produced in the U.S. from a variety of sources. However, current methods to liquefy hydrogen are difficult and costly, keeping this promising alternative fuel source from widespread adoption. The WSU spinout Protium Innovations, LLC has pioneered several foundational technologies that have the potential to overcome that challenge. At the heart of their innovation is a vortex tube that utilizes a quantum mechanical property unique to hydrogen for refrigeration. The vortex tube is low-cost and also smaller than current liquefaction methods, significantly reducing the capital cost of a liquefier. The researchers are incorporating that technology into the development of hydrogen fueling stations and tanks that will make the fuel accessible for use in cars and aircraft. Protium’s innovation provides a new opportunity for renewable energy producers, empowering them to capture the full capacity of their power generation plants. The goal of Protium founder and WSU professor Dr. Jacob Leachman, and his team, is to make hydrogen a viable fuel source, and make Washington a distributor, world-wide leader and net exporter. Currently working on proof of concept research, the company will begin looking for initial funding from sources like the Small Business Innovation Research (SBIR) program and local angels in the coming year. To decrease the impact of fossil fuels on the environment, researchers around the world are trying to develop cost-effective, alternative fuels and products. A WSU research team is exploring an option that would be a double win – reducing food waste and crop residue by turning it into biofuels and biochemicals that could reduce petroleum dependence. One of the challenges in developing bio-based fuels and chemicals is generating a sustainable supply of lipids, or fatty acids as either feedstock or key intermediates. Lipids are traditionally obtained from oil seed, but a more sustainable route is required for widespread industrial applications Shulin Chen and his team have modified a yeast strain to create a molecular platform, or a “cell factory,” that can produce more lipids from food waste and crop residues than current methods. The WSU research has particularly focused on the production of oleochemicals from this platform. Oleochemicals are present in everything from cosmetics to industrial solvents with immense market potential. Oleochemicals are currently derived from petroleum, as well as animal and plant fat. Using lipid derived from the food and crop wastes as the precursor, the researchers have been able to produce bio-based oleochemicalsthat could have major implications for sustainable manufacturing. At CleanTech Showcase, the WSU researchers are looking for partners who are potential uses of the biobased products, as well as funding opportunities for the next steps of commercialization of the technical platform.